Priyanka Chopra was seen in a high trailing stop with slit designed by Anamika Khanna on the red carpet at the Stardust Awards 2016. Trailing top had a high collar neck with a deep neck in V-shape for the event. Priyanka Chopra was styled with Nirav modi Jewellery and tightly fitted hair parted from the middle. Top Bollywood Actress Deepika Padukone wore a golden dhoti styled Saree along with crop blouse with a cape style jacket designed by Anamika Khanna. She teamed it up with gold Christian Louboutin shoes which looked flawless on her to make her look bold and beautiful as always. Sonam Kapoor in Anamika Khanna at Cannes showcasing her white dress during Cannes Film Festival 2016. Sonam kapoor arrived at the Airport wearing this white sporting outfit designed by Anamila Khanna accompanied by her sister and stylist Rhea Kapoor. Along with Sonam Kapoor, Aishwarya also stole the show on red carpet wearing Elie Saab Couture at Cannes. Sonam has already won the hearts of all Indians in Neerja and as always she is one of a top fashionista in Bollywood. 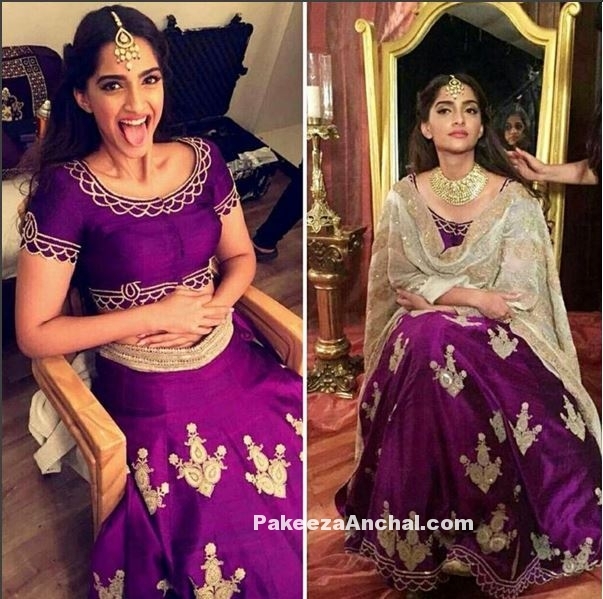 Sonam Kapoor look extra ordinary in this purple Lehenga Choli outfit designed by Anamika Khanna during an Ad shoot for Kalyan Jewellery. She looked stunning in this beautiful Lehenga Choli with Gold thread and mirror patch work wearing a neckpiece from Kalyan Jewellers for the advertisement. She was in a spontaneous mood and was making funny faces during the shooting. Sonam Kapoor during the 61st Britannia Filmfare Awards in Mumbai on Friday was seen in a white Lehenga and a white transparent dupatta on the red carpet designed by Anamika Khanna. She paired it with a Green emerald necklace and tied her hair in a knotted style to give herself a new look for the event. Prem Ratan Dhan Payo Actress looked stunning during the Filmfare Awards. Sonam Kapoor looked awesome in this Black ethic outfit with a simple Kurti and flared pants and dupatta designed by Anamika Khanna during the promotion of her upcoming movie Neerja. She paired it with a huge earrings from Apala by Sumit with red lips and braided hairstyle. Sonam Kapoor was wearing a greyish white long top and a wrapped skirt designed by Anamika Khanna. She paired it with a Amrapali Black metal Necklace Jewellery with a big ring and hangings of the same metal. She tied her hair back to look good during the promotion of Neerja. Bollywood Actress Shilpa Shetty Kundra looking beautiful in Designer Wear Lehenga Saree in Black with Pink Floral patchwork design on the pallu along with the border. Designed by famous fashion designer Anamika Khanna Lehenga style Saree has a silver border with sleeveless blouse with Black high collar round neck design. Sonam Kapoor’s Prem Ratan Dhan Payo’s (PRDP) is a superb Hit in Box Office. Just before the release of her film, she entered Bigg Boss House for promoting her new upcoming movie PRDP in High Collared Full sleeved blouse in dark green color with a heavy embellished Lehenga with Gold Zardosi work. She was looking awesome in this outfit by Anamika Khanna which gave her a prefect Royal look. She also wore a Rajwada Maharani Necklace to accentuate her dress. Sonam Kapoor and Salman Khan during the trailer launch of their new movie Prem Ratan Dhan Payo (#PRDP). Sonam Kapoor was wearing a White Long Frock Anarkali Suit embellished with fine embroidery designed by Anamika Khanna with a stylish hairdo. Sonam Kapoor looked beautiful in this Blingy Anarkali with a pearl mang Tika and red lips.